As I began my trek back east, I stopped in Lexington to see one of my closest friends. Requirements for this brunch included something quick and near the interstate. She suggested Wild Eggs. My great grandpa’s kitchen. By the time you came to his breakfast table, you were plenty ready to eat. Maybe you spent the past hour working the fields or gathering eggs from the henhouse. You might have visited your neighbor’s home for fresh milk or butter. Everything on your plate would have been made from scratch. And any meal, especially one made by my great grandma, would have included potatoes: home fries, hash browns, mashed potatoes, maybe even potato latkes. You were surrounded by family and friends at the table, sharing your plans for the long day ahead and having one more cup of coffee before heading to town. Life for my great grandpa revolved around work and family, making an honest living in a new land. Blessed with pristine streams, and rich soil, he began farming and selling potatoes and produce. He eventually opened the Zel Potato Company, selling his crops at the city’s farmers market. As the family grew, breakfast continued to hold its importance, serving as a touchstone between his life in the old country and his new life in America. My mother continued this tradition. She brought fresh eggs, stocked our refrigerator with the freshest locally grown produce, and fresh squeezed orange juice. And just like her grandpa’s kitchen, almost every breakfast featured potatoes. Wild Eggs believes it can start right where my ancestors left off- serving hard working people and their families with great wholesome food. This legacy will provide the breakfast inspiration for many years to come (Our Story). 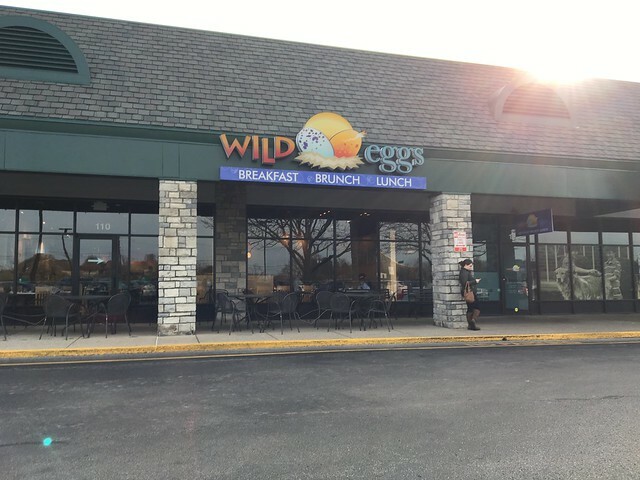 Wild Eggs has a few different locations in bordering states to West Virginia, but none in state. 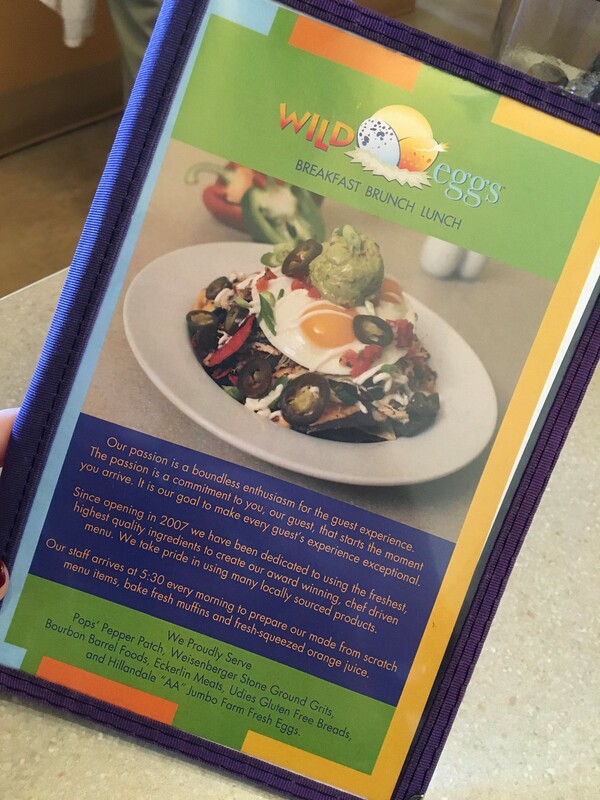 The menu features all your breakfast favorites - eggs, waffles, french toast, pancakes, biscuits & gravy, and even salads and sandwiches. 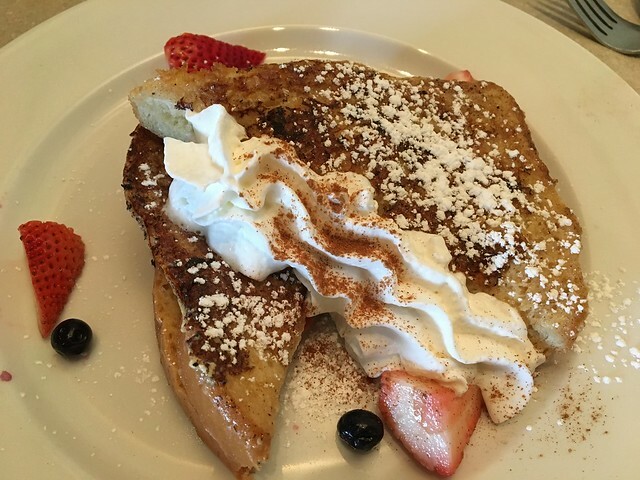 In typical Candace fashion, I went for the stuffed toast (mmm): Stuffed Thick sliced sourdough, sweetened cream cheese, maple syrup, blueberries and strawberries, powdered sugar, cinnamon and whipped cream. These were good, if not a bit too much. They got a little soggy with all the toppings involved. 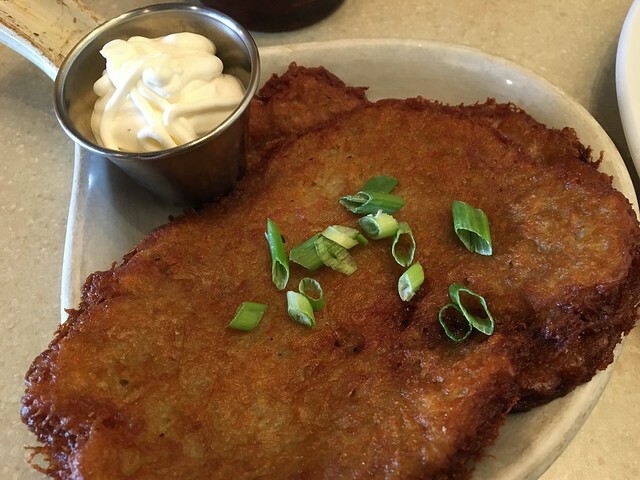 And, for a side, I got the potato latkes. Good, too! Just wish there was applesauce, as well. All in all, a pretty good meal! Plus, a little bit of everything for everybody.